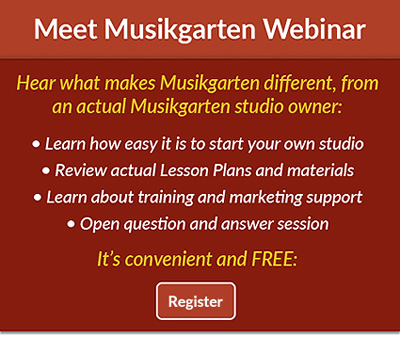 Webinars and workshops provide teacher training on Musikgarten’s movement and music philosophy as well as strategies for successfully connecting children to music. We encourage our teachers to take Musikgarten workshops outside of their current children's music curriculum, such as our Cycle of Seasons class and Music Makers series, to expand their children's music class schedule and reach a wider audience. Teachers have access to ongoing business support at the corporate and peer levels through one-to-one coaching, e-newsletters, a teachers forum, and our annual Festival. Here, Musikgarten teachers from across the nation convene to sing the songs and dance the dances from all levels of Musikgarten classes, gain insight into new research, share their success stories, and discuss business issues with their peers. Musikgarten provides a wide array of professional materials formusic teachers to market their businesses with, including colorful brochures, flyers, postcards, signs, a personalized website, and customizable co-op advertising. To find out how to become a part of the Musikgarten childhood music teacher team, contact us here.